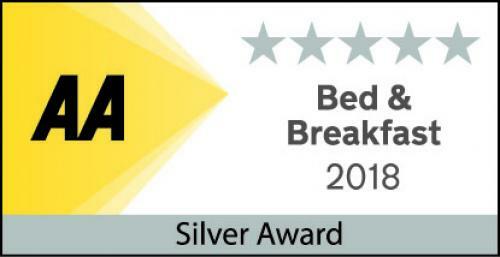 WE ARE DELIGHTED TO ANNOUCE THAT WE HAVE JUST RECEIVED OUR 2018 AWARD FROM BOOKING.COM FOR 9.6 OUT OF 10. THANK YOU TO ALL OF OUR GUESTS WHO HAVE GIVEN US SUCH GREAT REVIEWS BUT, REMEMBER, YOU CAN GET AN EVEN BETTER DEAL IF YOU BOOK DIRECT WITH US!!! HAPPY NEW YEAR EVERYONE. Bracken House, formerly a Victorian rectory, a luxury AA awarded 5 star with a Silver Award Bed and Breakfast has four en-suite bedrooms peacefully situated on the edge of the North Devon village of Bratton Fleming. It is in a truly quiet spot with wonderful dark skies with very little light pollution and NO ROAD NOISE as we are down the end of our own drive. We are within easy driving distance of the spectacular coast, Exmoor and many other local attractions, including National Trust properties, gardens at RHS Rosemoor, Castle Hill, Marwood and Tapeley Park. The drawing room, with its Jetmaster open fire, is available for guests to relax in and also has lovely views over the garden and towards Hartland through the large bay window and the dining /breakfast room has a wood burner which is lit in those cooler mornings. We also provide FREE WiFi which is super fast broadband which can be accessed from every bedroom. BOOK DIRECT ON OUR WEBSITE FOR THE BEST PRICES!! A 10% discount on our rates for double occupancy is available ONLY if you book through our website for three or more consecutive nights up to the end of April 2019. You will not find this rate anywhere else! For two nights only, there is a 5% discount through our site. If you are having a problem with the booking process, please call us on 01598 711810. Please see the descriptions for each room under the headings below. We regret that, until the 1st April, the Wodehouse suite will not be available for booking via the website. All other rooms are fully available. Guy and Sue look forward to welcoming you here soon! Wodehouse is our premium four poster room with views over the both the front garden and down to Hartland Point in the distance.There is a wall mounted flat screen TV, coffee and tea making facilities including a Nespresso machine.A doorway leads through to the huge en-suite bathroom with freestanding bath, vanity basin and separate large shower cubicle. Jeeves is a lovely light room which sleeps 2 and looks over the garden at the front of the house and the surrounding countryside and can be made up as a double, or a twin if requested, with a 32” flat screen TV with Freeview and coffee and tea making facilities including a Nespresso machine.There is a large hanging cupboard by the newly upgraded shower room with a power shower. Wooster is on the first floor and sleeps 2 in a 5'0" king sized bed with en-suite shower room which has just been upgraded (2018), a 32" flat screen TV and coffee and tea making facilities including a Nespresso machine.There is also a double sofa, lovely views from the room looking down to Hartland Point in the distance as well as a lit make up mirror and wardrobe.